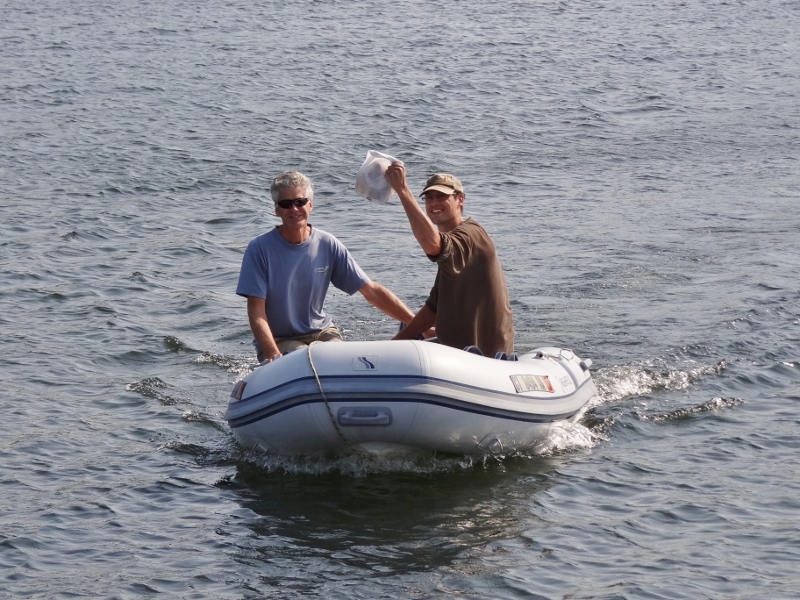 Sunday, September 3 we dropped our mooring lines for the last time and headed into Kingsland Bay about two miles south. The wind was going to pick up from the SW, and why be uncomfortable when you can be very comfortable! 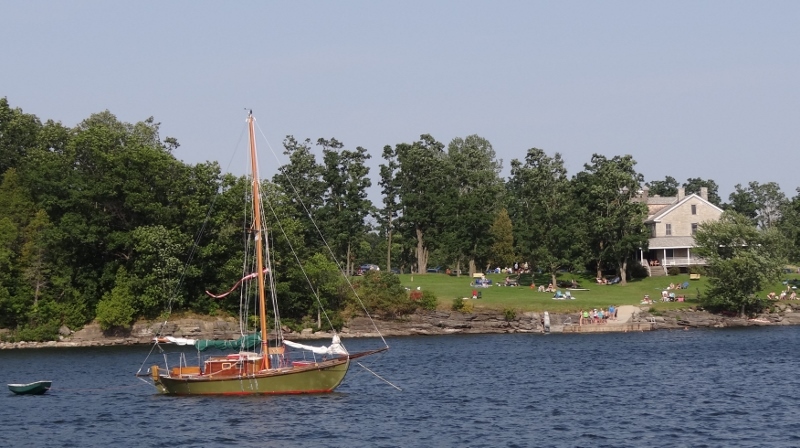 The State Park was even more perfect in that we could land the dinghy and get ashore. Thus, Benj could enter the park and we could pick him up. No launching the dinghy in heavy seas and sloshing about trying to raise it later which would be our fate at the marina. We executed the perfect plan; Benj would arrive around 10am when the park opened bringing delicious and fresh donuts from The Bagel Deli (next door to the Co-Op) for the three of us to enjoy as a mid-morning treat. 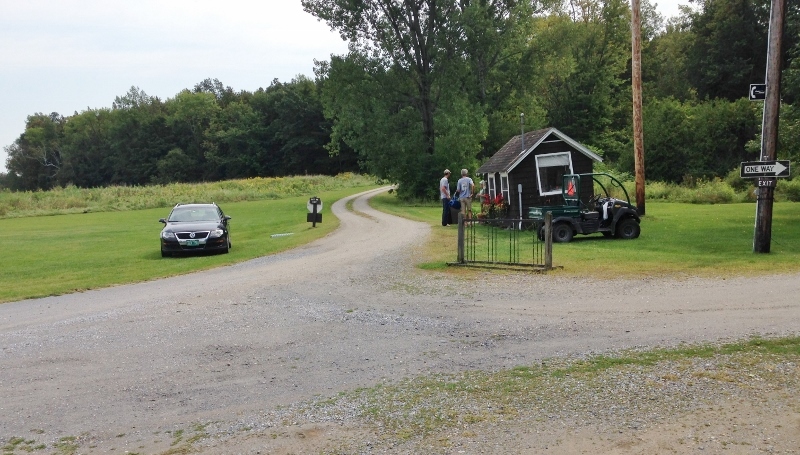 Vermont State Parks charge $4 pp fee; that was the only downside- but hey, he’s worth it!! After we finished extolling the virtues of freshly delivered donuts, somehow we managed to get our butts in gear and head in for that necessary grocery trip. The day was still cool and the park just beginning to fill. Since we’d be returning with three instead of one, we paid for Russ and I and explained our situation to the attendant. These cruisers, always with some strange story. The dinghy dock was adequate. The stairs up to the lawn roped off so we had to do a bit of climbing around. Yep, just trying to get our money’s worth here! 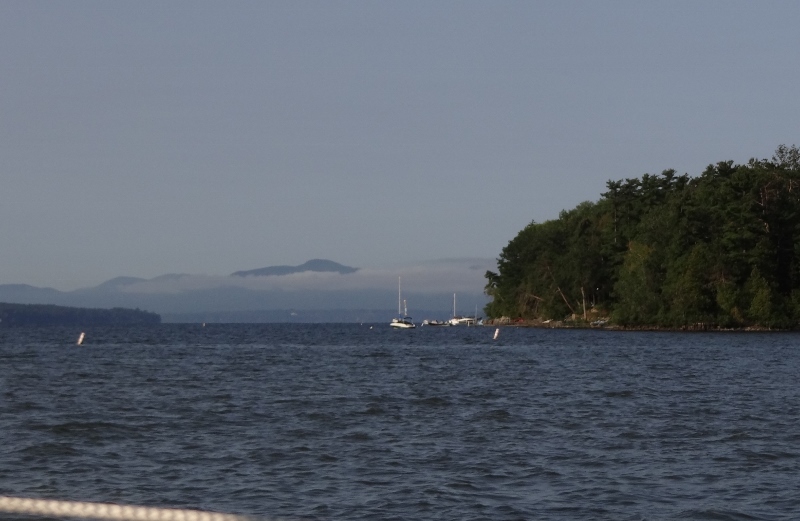 Benj hung around for a while 🙂 We did the farewell thing 😦 Russ brought Benj ashore and we were left to being incredibly grateful for such a superb month in Lake Champlain. For those who may read this hoping to learn about the Lake’s anchorages, places to visit, etc, we have likely done a half-assed job but the other half was spent on land in great company of family and friends. 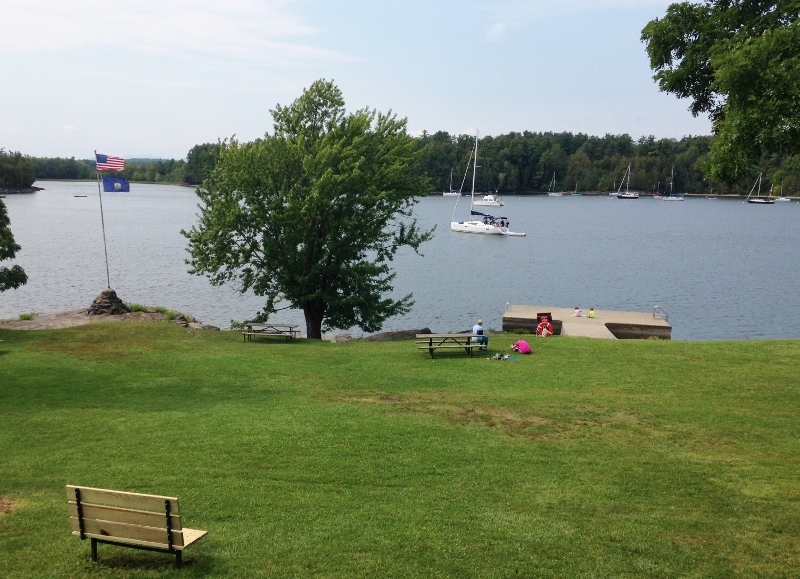 We didn’t get up to Mallets Bay, nor to Burlington by boat, but we did get to all the other places we wanted. And so dear reader we come to the end of our second year in Twin Sisters for a total of seven full years since we became wandering nomads. To recount: 4 years on s/v Ortolan a Maine Cat 41 catamaran, 1 year in a motorhome and 2 years in this PDQ34 power cat. 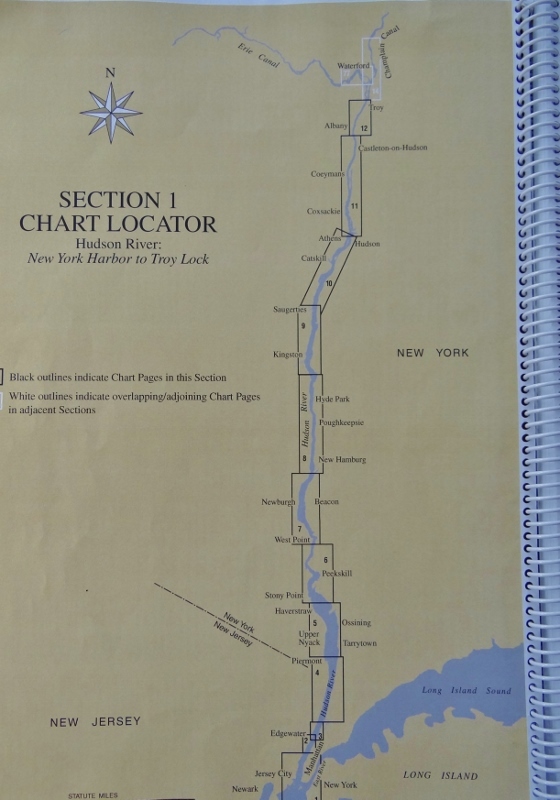 I know these chart photos would have been more helpful at the beginning of our Hudson/Lake Champlain trip, but what can I say except better late than never? We began just to the right of the spiral, traveled left (west) down the East River, rounded the tip of Manhattan and north up the Hudson river. 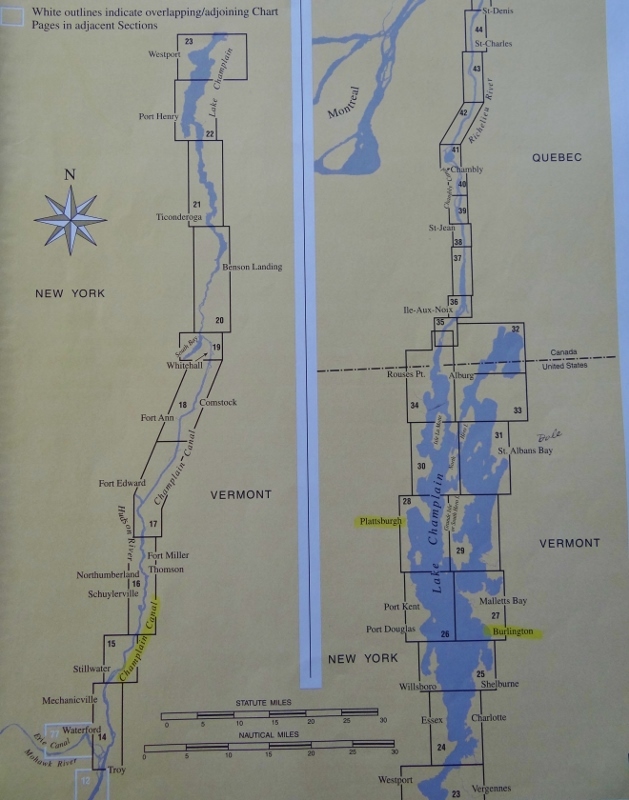 The first lock we came to was at Troy, just south of Waterford where the Erie Canal takes you west across upstate New York, or the Champlain Canal (still the Hudson at times) brings you in Lake Champlain. Here’s a few stats from this cruising year which began Sept 20, 2016 in Mystic CT and ended Sept 4, 2017, a short 350-day year. Each “year” varies depending on when we begin our trip south. Nautical miles: 4,188 or 4,927 land miles. 570 of those nautical miles took us to places we had never before explored by water, namely north of Manhattan! Of the 350 days, we spent 135 at anchor, with the remaining days somewhat equally split between moorings and docks. I’m pretty sure that PDQ Year2 was a lower than usual percentage of nights at anchor; Hurricane Matthew and the Hudson/Lake Champlain trip adding more to the mooring/dockage side of the equation. We sit in amazement at how seven years have flown by. This coming year, “PDQ Year3” looks to be similar to others with a few differences; one will be far fewer postings!! Haven’t you seen and heard it all already? Aren’t there over 500 posts you can read if you want to? I look back once in a while and always find one I don’t remember writing.